The Government has signed a contract for the purchase of five Russian made super jets to be delivered in the country by early 2018. Four of the five aircrafts are Sukhoi Superjet 100 passenger planes while one is a VIP version for President Edgar Lungu. The other four planes will be used for the soon to be re-launched state owned Zambia Airways. President of Russia’s United Aircraft Corporation (UAC) Yury Slyusar said on Friday that the country’s Sukhoi Civil Aircraft company has concluded a contract with Zambian carriers to deliver a total of five Sukhoi Superjet 100 passenger planes in 2018. “The delivery of the aircraft to the African continent will take place as early as next year,” he added. The SSJ100 is a twin-engine plane made by Russia’s Sukhoi Civil Aircraft Company. It can transport up to 98 passengers and fly distances of up to 4, 400 kilometers. The jet made its maiden flight in May 2008. 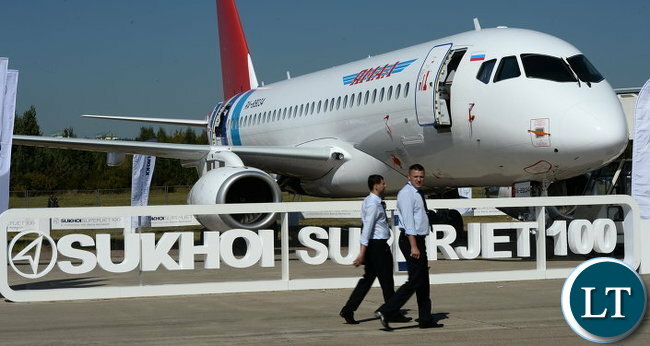 Around 2014, the SSJ100 aircraft was fetching around $35.4 million, according to Senior Vice-president of Sukhoi Civil Aircraft, Customers, Igor Sirtsov. This is lack of priorities!! !, Lungu does not need a new Jet, what is wrong with the one he is using??? You mean as a country we don’t need an airline? And you want an explanation on why the president needs another plane? Real people from Mwense don’t think like this Mwense here. This is real progress for the smart people of the Zambian Enterprise. And yes, the President needs a more secure VIP jet one in which he would be in full command and control of the entire Zambian Enterprise while in the air. One which can jam anti-misille projectiles from the air. The current challenger is a private plane not capable of any maneuvers in case of emergency and/or being targeted by a surface to air batteries. The Russian are capable of producing the right plane for such endeavors more closely to the one Vladimir Putin himself uses. That’s good. HH won’t object to that. That plane Edgar used from Swaziland is nice. Ba Lungu balipalwa sana sana. He was a poor man but he got blessed and this is what he gets as a blessing. I urge the president to enjoy his time full throttle. Ala bane ichikonko chimikate ba opposition. Stay blessed Mr Lungu and family. However, I would have taken over the challenge from Airbus last year to buy their equivalent of this plane especially the Airbus 321 which seems to have the same capacity as SSJ100. Meanwhile, step in the right direction and great job to the guys at transportation and commerce for making this happen. And since, this particular aircraft can seems to handle continental flights, the new Zambia Airways needs to seriously look at wet leasing used Dreamliners for trans-Atlantic and trans-India flights. They need to partner with a great alliance such as the One-World or Star Alliance that way they can Code-Share and get into the long-range flight business. VERY GOOD. I LIKE THIS. AT LEAST THE LONG OVERDUE AIRLINE WILL FINALLY, RESTARTED. THOSE PEOPLE WHO KNOW WHAT THIS MEANS MUST BE PROUD OF THIS. UNLESS THOSE WHO DO NOT KNOW HOW THE ECONOMY HAS BEEN TIED DOWN IN THE LACK OF THE NATIONAL AIRLINE. WITH LUAPULA EXPO, NEW INTERNATIONAL AIRPORT IN THE CB, THE EXPANDED KK AIRPORT, HARRY NKUMBULA AND THE IMPROVED ONES- THIS WILL BE THE BEGINNING OF REAL TOURISM AND FRESH FOOD EXPORTS TO EUROPEAN AND OTHER NEIGHBOURING COUNTRIES. AND NOT FORGETTING INDUSTRIALISATION. GREAT MOVE. HOWEVER, THE ONLY DOWN SIDE IS WHY WE DID NOT BUY THESE PLANES FROM FRANCE WHO EVEN OFFERED FREE PLANES, FREE PILOTS, ENGINEERS (ETC) TRAINNING FOR THE NEW AIRLINE. AIRBUS HAS A VERY GOOD REPUTATION IN THE MANUFACTURE OF AIRCRAFT. That’s where the big bucks are … you see small countries like Qatar and UAE that virtually have no local airline dorminance in their own countries but have such a huge presence on the international flight market? Because real profits are realized from long range flights. Even during the old Zambia Airways era, the most profitable routes where LUN to JFK via Monirovia, LUN to Bombay via Cairo and the famous nonstop Lusaka to London Heathrow. With the new Zambia Airways, imagine flying nonstop from Lusaka to New York, from Lusaka to London, from Lusaka to Shanghai and Lusaka to Sydney. That’s where the big bucks are. Let’s fly better again, let’s fly Zambia … Zambia Airways, we getting better all the time, getting better everywhere. Nkwazi was the first airline I ever flew and our girls were more beautiful than Lufthansa girls … this is nostalgic for me. Back then, no one had more beautiful air hostesses than Lufthansa and Zambia Airways. The entire world adored our service in the air. Not even British Caledonia would compete on the London route. When I tell people that Edgar is an impetuous Lazy Bum you think its an insult…when it comes to front end services they rush to obtain EXIM Bank loans here is a classic example of clear lack of priorities. Surely how can you blood not boil…you have no tap water in UTH but you have money for these aircraft with a poor safety record. Iwe Ka Jay Jay … walitumpa sana boyi. Do you know how many jobs an airline produces? It’s is by far one of the largest employers in normal commerce. Have you seen how many people line up whenever you land? You have baggage handlers, you have food service trucks, you have jet fuel trucks, you have ticket attendants, air traffic control, you have aircraft mechanics on the spot, the list is endless … that’s progress. Bushe imwe ba mambala ni mbwa nshi yalowa such that to you everything progress ni nselefye kuli Lungu. Why are you obsessed with Lungu? Waliba gay??? Nga cakukalipa at UTH doesn’t have any water talk to Lusaka City Council or even better go dig some wells and provide UTH water for a profit. Kusabailafye lyonse with no actionable plans. You are the guys we used to call “all hat and no cattle” in Texas. Always wearing a hat for something but nothing to offer in return, we cowboys disdain cretins like you … Jay Jay. Look at B R Mumba, Sr typing away with the excitement of a rodent in a canteen refuse bin typical of the enthusiastic dreamer he is…you have lamentably failed to record a profit in the telecoms sectors and you think you can run an airline with dodgy soviet jets….really laughable…just take some more sleeping pills so you can dream about the Zambia Airways years. PF has no money to buy planes. Those planes have just been rented by PF for God knows what reasons. One fact is one plane had been rented on behalf of Zimbabwe whose planes are now getting out of service . All this means Zambian will more thtought their nose for improperly thought out venture to steal money. Now back to the topic, who tells you these are the only jets the new Zambia Airways will have? No starters, no real airline flies only one type of aircraft. This is just the beginning!!! We are expecting the next fleet to include Boeing, Airbus even Bombaire. For you information everyone will fly Zambia Airways except unpatriotic foes like you.
. We need that direct route to Europe and that’s a priority given the economic benefits. I’m hoping and praying this is fake news! I don’t agree with this move! I as one of the true ECL supporters just as I disagree with the use of luxury SUVs, the appointment of the likes of Dora, Mutati, the huge cabinet, the unnecessary huge number of staff in the foreign service etc…we need to save every little ngwee – advisors where are you? Also Russia is not the right country to be buying planes from as they have a very bad record with their passenger airplanes as far as I recall. Let’s be fair here any ngwee spent on such vanity projects would better be used on educating the kids and constructing better roads! Please let this be fake news!!! Kamwendo-munjia has bought himself a new plane!! Ma ma ma ma, the evil dictator will now travel out of the country every week. Never mess with Russian mafia! When they want their money back there will be no if or but like what PF is doing to the cuurent lenders. Instead of thinking of manufacturing pur own machines these *****s piorities is to enrich themselves through deal cuts. KK failed to run Zambian airways when corruption was just 100th of what it is under PF today. For how long PF will sustain this I do not know. For PF cadres at least free transport iyo yamoneka. Pankongole. Only mafias can invest in a country like Zambia at the moment. BR Mumba reminds me of the assassination of Juvenal Habyarimana Rwanda’s president in 1994. If it can happen in 1994 it can happen in 2017. Not everyone loves state presidents so all efforts should be made to protect them. However I don’t think we need a national airline. The Zambian Watchdog reported this a long time ago and we all thought they were just lying. This airline is already a flop from this useless purchase. Zambians tighten your belts for more hardships. Another establishment of a National Airline with no Strategy, Russian planes, Good luck if it does not crush on day one. Which Airline uses them?? Not even AEROFLOT The Russian Airline uses them. For sure they just signed just coz Lungu got a free plane. Airline business has become so competitive; Profits is in Long Haul not your domestic operations. Bad start and will be another failure. We don’t have the capacity to sustain a national airline. Where is Zambia Airways today? Just work hard my friend, the money is in form of a loan specifically for such projects and NOT for buying food for lazy people like you. THE THINKING OF SOME ZAMBIANS, ESPECIALLY THOSE FROM THE NORTHERN AND EASTERN PARTS OF ZAMBIA IS SO PATHETIC THAT I FEEL LIKE VOMITING. DO YOU THINK LUNGU GETTING A NEW PLANE IS A PRIORITY? YOU EVEN REJOICE AT THAT? I HAVE NEVER BEEN SO ANGRY! WE CALL OURSELVES HUMAN BEINGS WITH BRAINS? ZAMBIANS IN GENERAL ARE DUMB AND STUP1D1. COMMENTS BY B.R. MUMBA ARE SO SICKENING BUT UNFORTUNATELY THEY REFLECT THE GENERAL THINKING OF ZAMBIANS AT LARGE, THAT IS WHY THEY ARE TAKEN ADVANTAGE OF BY LUNGU AND HIS STOOGES. I FEEL SICK TO BE A ZAMBIAN. @2 Dexter, THAT WAS THEN, THIS IS NOW. THE SITUATION MIGHT HAVE NOT SUPPORTED RE-INSTATEMENT OF THE AIRLINE. HOWEVER, MANY THINGS HAVE HAPPENED NOW INCLUDING NEW AIRPORTS, NEW TOURISM AMBITIONS, NEW INDUSTRIALISATION AMBITIONS, NEW TRADE AMBITIONS WITHIN AND OUTSIDE AFRICA, NEW AND OLD FRIENDLY COUNTRIES, NEW FARMING BLOCKS, ETC. SO, ZAMBIA HAS MOVED ON AND CONTINUES TO MOVE ON FORWARD. IN SHORT, NOW, WE NEED THOSE THINGS WE DID NOT NEED WHEN WE WERE NOT READY. New State House and now new big jet and yet 80% of citizens are living tin poverty. Poor people will their for ever ,even in times of Chris Jesus they were their. You NEED an airline for what exactly?? nayonayo…..more spending….kaili the IMF money is coming! Is Lungu normal? This is a man that claims to be humble. This is the same man that says he fears God. How does he justify such expenditure? These people have zero interest in the welfare of citizens. They will not stop until they bleed the country dry, and leave you people that voted for them in huge debt. I am sure the cadres here will defend them. I would not be surprised if kick backs were involved in these transactions. And come on, who buys Russian jets these days? Who will maintain them? These politicians are too careless with their politics of the belly. I am speechless …how anyone can justify this procurement is simply beyond me!! Good Move. We a need a National Airline. Tired of boarding other nation’s Airlines. Support your local team…. Where are you going to fly to? You are happy to borrow and import foreign staff to build roads yet you are concerned about flying…the only people who will filling these planes are cabinet ministers and their families paying on credit. You foooools are like Zebras at a waterpond which is croc infested…going to the very spot to drink!! this is stupid,thought the ZWD was halusinating,,what are our priorities as a country really??? Larry Mweetwa at work. Which Zambian companies? We only have Proflight and Mahogany air, and there is no national carrier established yet so to whom were the aircraft sold? Q: Who can be so desperate to peddle misinformation and fake news? Iyee!I thought Boeing and Airbus are ideal companies to deal with. Sorry to inform you TMK, but those companies do not give out kickbacks or pay BRIBES! So Zambians will be paying huge sums for substandard planes that never make a profit, and the pilots and technicians from Russia for many years to come. One thing Russia is good at – laundering stolen taxpayers money! Terrible clearly contradicting himself …you think you can simply change your name and people will not notice your dull self!! Russian planes have a poor safety record.Isn’t this a treasonous move? Have you noticed a pattern here …the Russian always do their investigations and the Pilots are always sacrificed. Good move. We may get lucky. Remember Samora Michel? What about their fighter jets (su 34) and their space ships, poor safety record? American shuttle exploded in mid air. Let’s be fair to Vladimir. Try to remember Russian naval aviation “perfect record”!!! 12 planes out of 12 involved in crashes resulting in total losses!!! We definitely need a National Airline to fly our flag everywhere but the timing is wrong. Why do we need IMF? @15 Vantage point, you are right. Currently the Americans and Europeans and Japanese use a Russian space shuttle to ferry their astronauts to and from the international space station. Q: Who said those negatives about the Russians? Q: What you get when genetic experiment gets wrong? The Jet is to be used by Lungu and successive future presidents.And the four? UPNDonkeys, for a change put your energies to preparing a solid defence for underfive rather than spreading fake news. Remember that this time underfive is inside and NOT outside prison, so you cannot affird delaying tactics like preliminary issues when your lawyers are lost at law. We can see that you are not prepared for the underfive’s treason case because you think there is no evidence or it is just a traffic offence. Q: Who is not prepared for the treason trial? Russian planes? Safety? Were aviation experts consulted? Or is this ifakumwena kubukulu by Ba mwine? I would have supported this if the planes were coming from Boeing or Airbus! This purchase is not good value for our meagre resources. I don’t board Russian planes! We don’t need planes to take sick ministers out side the country for treatment what we desperately need are hospitals, schools,and a decentralised system of government not always having to travel to Lusaka 52 years post independence! It is not President Lungu’s Jet for goodness sake. This is a presidential jet if procured and will be used by any employee that the Zambian people employ after the 2021 elections (Interviews). This kind of reporting is not correct as it portrays that some one was buying for himself. South Africa had a problem with presidential plane to the point that they had to pay huge sums of money to hire private jets for the president. The third world mentality is a catch 22 because even what seems to make sense does not. WHAT IS WRONG WITH THE CURRENT PRESIDENTIAL PLANE WHICH IS IN VERY GOOD CONDITION? IT IS IMPORTANT TO MAKE SOUND DECISIONS FOR THE COUNTRY FOR THE BENEFIT OF THE COUNTRY, PRESENT AND FUTURE GENERATIONS. IT IS A ERRONEOUS TO THINK THAT THIS MISMANAGEMENT OF NATIONAL AFFAIRS WILL ONLY AFFECT PEOPLE FROM SOUTHERN, WESTERN, CENTRAL AND NORTH-WESTERN PROVINCES. NO ONE WILL BE SPARED FROM THE F00LISH DECISIONS BEING MADE NOW. NO ONE WILL BE SPARED. EACH AND EVERY ZAMBIAN WILL BE AFFECTED, REGARDLESS OF TRIBE OR REGION, EVEN LUNGU HIMSELF WILL BE AFFECTED. @MANOMAMBULWA, Do you know the distance the challenger can manage? Who told you that it is in Sound Condition? Why are you so ***kin bitter? I hope Russia Is Not Supplying ”Illegal” Arms to Warlords. Last time i checked they did just that, in war torn African countries like Congo, Sudan etc.. Wait a minute guys! Was this purchase of airplanes planned for in our national budget? If yes, then all is fine. But if it is no, then where did the money come from? Are we running a parallel Zambia underground where things are unseen in plans, but seen in deeds? @Juliaf the order is for 2018. Read the article thoroughly before commenting. All in all it is a brilliant move. Those planes are for Zambia not PF or President Lungu. Give credit where itvis due. Good initiative. But the airline industry is a very competitive business with passenger having a lot of options to chose from. It has very little returns on investment, so takes time to recover even rge initial investment. Most airlines only succeed by synergy. We shall see. Mr. Mumba you are right! @”Mwense” Habalunshi is fake! You know who he is! He should not be afraid to state that he is Habalunshi! After all you can check all comments and you can tell who the Namwala person is! The only objection I have is that they should have bought American-made planes. The Boeing planes have a better safety records than Russian passenger jets. I hope and pray that the Lord will safeguard all passengers. Regardless, Hazaluza Hagain! @2020 blind #29, Is there anything that you, your Under Five Card Clinic and your Namwala hooligans ever agreed too? You guys from a delusional party. Check presidential jets in Africa and you will be amazed for Zimbabwe, Egypt, Nigeria, Morocco, etc! Zambia is not even listed! The evil spirits of Free Masons are contagious and you can’t think independently because of the prevalent collective thought tribal process known as tribalism from Namwala! @Mwense Habalunshi, what is your priority? Amageddon? Why buy Russian technology which everyone is avoiding. Zambian airline? This is another case of failed project. Zambian airline will not compete with other regional airline unless it will go into alliance into big airlines as feeder. B R Mumba is just a pathetic pretender who thinks he knows it all. Please people just ignore him. B R Mumba is on food stamps here in the USA. Don’t listen to that free loader. He is pathetic. Whilst on your shopping spree,also equip UTH n other hospitals in the country. Theyz a lot that is needed in these hospitals as you know not everyone can afford to be medical tourist. TEHRAN, Jan. 02 (MNA) – An official of Iran’s Aviation Companies Association said purchasing Sukhoi Superjet 100 (SSJ100) aircraft is no more at stake for it suffers from a technical issue with its empennage. 4400 km flying Range? If this is correct then these planes cannot fly you beyond the east African region without refuelling. Lusaka to Cairo e.g is 7000 km while London is is over 10,000 kms. This could turn out to be a disaster of a purchase. It doesn’t seem good to me to get excited about. Who in their right mind buys jet planes from Russia. Airbus and Boeing are the industry standard, you don’t buy junk planes unless you are expecting some kickback commission. Priority should have been given to Sorting out the railway system that would benefit every Zambian. Upgrading and installing 2 running rails across the country was going to benefit and uplift many many Zambians out of poverty. Those planes are for the rich and corrupt. Wrong prestige priorities by PF. They only bought those planes to show off the new KK international airport. Apart from priorotising the railway , At $34 million a peice for those jets manufacturing plants to boost exports would have made more sense , but again that involves work and needs men and woman of wisdom. I the one that crashes will be carrying Lungu and his minions. Is there a business case for the setting up of a national airline. Most airlines are surviving on the treasury (SAA, KA etc). I can bet this will be a white elephant. Local private airlines have been struggling like forever with a lot of casualties. I wait for 2018 to see the failure of another off-the-cuff (unplanned) project. Numbers don’t lie. Zambia the mediocre country! The most pathetic outcome of this news is the response of some people here. I am struggling to hope that they do not represent the views of many others in the country. The likes BR Mumba above. Expressing themselves in meaningless lofty ‘business’ diatribes. An airline under this government – really? You can even unashamedly try to justify a new jet for Lungu? For goodness sake! New state house, new airports when public institutions are so run down and have reduced the lifespan and quality of life for many? If SA airways is struggling, where is the business going to come from in Zambia? R Mumba is useless and doesn’t know crap, don’t mind him trying to sound like he is smart,he is f00l living here for free. I know him. Useless chap. can you tell us the state of the railway systems in those countries ??? because our ZR that is supposed to cater for the poor is bankrupt and we have people dying like flies on our roads ?? LEASED OR BOUGHT SOME IS THE QUESTION ALSO ??? Russian jets costing only $35m because they’re new untested superjets and Zambia has agreed to be their cheap test monkeys . Imagine ..I doubt if these things can fly in European airspace as they things do not meet safety standards…a plane that was designed in 2008!! This is fake news, lacks details. How much did they cost? who from the government signed this deal? who is financing the project? There’s more to the purchase of the planes than this article portrays. My wild guess is that Zambia will pay in kind. Remember Zambia has uranium deposits. Are these guys trying to do a deal for a stake in the mining of Zambian uranium? You can’t just rush a decision to start a national airline. l can smell a very big fat rat over this contract! Aside from this being wasteful expenditure (as usual), Russian planes have a terrible safety record. Zambian ignorance on all levels is alarming and down-right sad. No wonder we have these sorts of jokers and half-wits in leadership positions taking us nowhere fast. Tragic. Br Mumba Sr with all due respect I love your excitement. I only used the defunct Zambia Airways once. I see jobs for cadre’s and plenty of whacko no whacko before talking about bailing out airline which will then be money down the drain. I went to Nchanga North Hospital yesterday I saw no water in the ward toilets and we feel able to run an airline when we have failed a hospitals. God have mercy on us. It is so sad , that a lot of money is being spend while unemployment is very high , services in the hospitals , councils, government institutions are deplorable state. I wonder where these planes will fly to. The airline business is cutthroat. Most of the state owned airlines are loss making entities. XRNKE raises genuine concerns . Can these be verified ? The youth in the country are unemployed. Look at the number of youths walking the streets aimlessly on say a Monday and the government sees it fit to venture in these loss making business. SAD! Surely they should have run an open tender, or at least tell us the criteria used for purchasing these Russian made aircrafts. Safety wise, the Russian made aircrafts are a huge concern. Who is going to get into these jets tainted with safety compromises? And there is one for the President. Whoever bought these planes should explain, because he is putting at risk a lot of people including the President. Good Move. We are back. The national airline can be self sustaining if well managed and consequently contribute to economic growth/development. I am just curious, ‘SUKHOI’ in Russian means ‘DRY’ in English. Look at the news they grounded half of all those built. Lots of Western airlines don’t trust Russian built aircraft they just don’t have the build quality of airframe builders like Airbus and Boeing. Also of course Airbus and Boeing already tried and trusted airframes in the same class as the S100. The only thing that would appeal to the airlines is the S100 is much cheaper. But there is nothing more expensive than a airliner which can’t fly. Airlines need aircraft which they can rely on. Is it still true that Russian company has a lack of past performance in the market and no track records? The answer is definitely – yes.